Getting Information At A Single Place Is More Convenient. In Industrial Panels, Placing Three Voltmeters, Ammeter, Frequency Meter And A Power Factor Meter Is More Space Consuming. Instead Of Using Three Voltmeters, Ammeter, Frequency Meter And A Power Factor Meter Separately, We Can Use All These Four Meters In A Single Meter. This Reduces More Space On Panel Door. 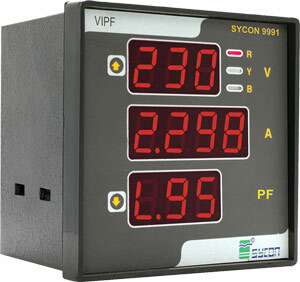 VIF-PF Meter 9991 Is Made For The Same. 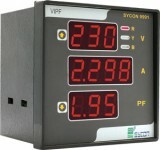 VIF-PF Meter 9991 Is Capable Of Measuring Six Voltages, Three Currents, Frequency And A Three Phase PF In A Single Unit. VIPF Meter Continuously Senses Three Input Phase Voltages With Neutral And Phase Currents And Displays Them. Combined Display Voltage, Current, Frequency & Power Factor. Site Adjustable CT Primary Up To 6000.